Turkmen President Saparmurat Niyazov has banned the playing of recorded music at all public events, on television and at weddings. In a decree, Mr Niyazov said there was a need to protect Turkmen culture from "negative influences". This is the latest move by the authoritarian president to minimise foreign influence in the isolated former Soviet state, analysts say. He has already banned opera and ballet, describing them as "unnecessary". Mr Niyazov's decree was published in the official daily newspaper Neitralny Turkmenistan (Neutral Turkmenistan). It banned sound recordings "at musical performances on state holidays, in broadcasts by Turkmen television channels, at all cultural events organised by state... in places of mass assembly and at weddings and celebrations organised by the public". The president was quoted by the newspaper as saying the move aimed to "protect true culture, including the musical and singing traditions of the Turkmen people". "Unfortunately, one can see on television old voiceless singers lip-synching their old songs. "Don't kill talents by using lip-synching... create our new culture." 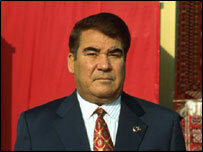 Mr Niyazov - known as Turkmenbashi, or father of the Turkmen - has ruled the desert state since the Soviet times. He has created a vast personality cult around himself, issuing decrees regulating behaviour in all walks of life. In 2001, Mr Niyazov - proclaimed the president for life - called for youths not to get gold tooth caps, also urging a crackdown on young men wearing beards or long hair. 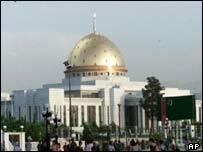 Pictures of the president adorn public buildings and his book - intended as a moral and spiritual guide - is compulsory reading throughout Turkmenistan. To many, his rule is alarmingly authoritarian, BBC Eurasia editor Catherine Davis says. People who know him say he appears to believe he was sent by God to lead his nation into what he calls a "Golden Age", our editor says. Beyond the elaborate building projects in the capital lies an impoverished country, where surveillance is commonplace and any public opposition a rare event, she adds.